The University of Illinois Springfield, Junior League of Springfield and the United Way of Central Illinois honored more than 60 local volunteers and businesses during the 8th annual Good as Gold Ceremony. The event was held on Wednesday, April 13, 2016 at the UIS Public Affairs Center. 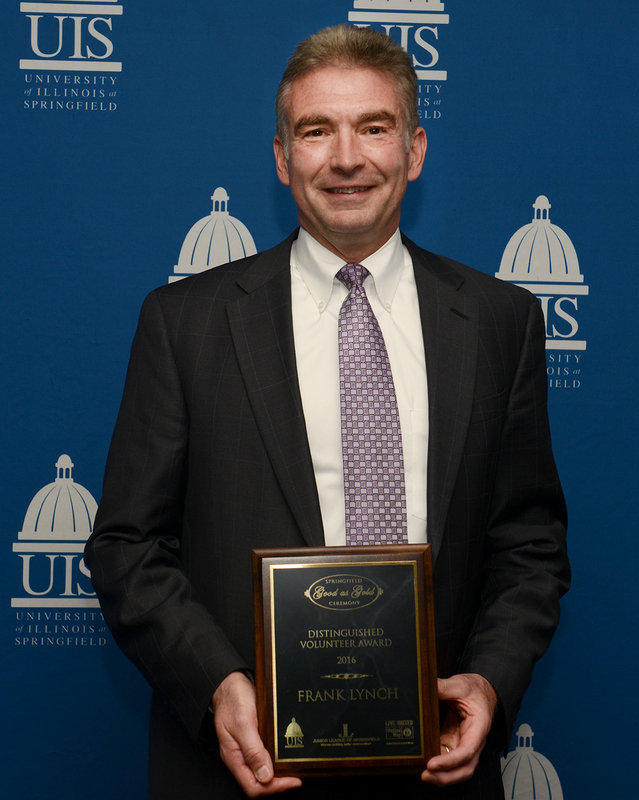 Springfield attorney Francis (Frank) Lynch of Wolter, Beeman, Lynch & Londrigan, LLP was honored with the 2016 Distinguished Volunteer Award. He has spent numerous hours volunteering with the United Way of Central Illinois, the Springfield YMCA and the Boys and Girls Clubs of Central Illinois. Lynch currently serves as a member of the United Way of Central Illinois Board of Directors, chair of the Board’s Community Impact Committee and president of the Sangamon County Emergency Food and Shelter Program. He has served on several strategic planning committees and has contributed to several United Way campaigns. While volunteering during a recent United Way Day of Action, Lynch was assigned to the Boys and Girls Clubs of Central Illinois. Even though the project had nothing to do with the club’s lawn, Lynch took it upon himself to become the “unofficial lawn expert”. He now personally treats the club’s lawn with fertilizer, seed, and weed killer several times each year and is always looking for other projects to take on. “Since his involvement, our green space has become a lot greener and is a much more welcoming place for our kids to come and enjoy time outdoors,” said William Legge, executive director of the Boys and Girls Clubs of Central Illinois. Lynch also served on the Springfield YMCA Board of Directors for six years, 2 years as president. He has been a YMCA member for more than 25 years and has volunteered his time at countless special events. He has served as the YMCA legal representative and has participated in several fundraising campaigns. Lynch’s dedication to service started in the Boy Scouts as a young man. He still maintains his membership in the National Eagle Scout Association. He also mentors other attorneys through the Illinois Institute for Continuing Legal Education. UIS student Jessie Edwards of Forsyth was honored with the Star Student Award for her volunteer efforts. As a student in the UIS Perspectives on Poverty Service Learning course in 2014, she started a program called “Warm Hands for Young Hearts”, in partnership with Macon County schools. While coats and hats were coming into the schools, there was a shortage of gloves. Edwards solicited donations from local businesses for the gloves and delivered them to elementary schools in Macon County. Even though her class has ended, Edwards has decided to continue the “Warm Hands for Young Hearts” program in Macon County. She also volunteers at the Northeast Community Fund collecting food, serving Thanksgiving meals and working in the office. This semester she is mentoring a family. 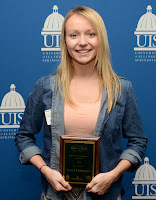 Other UIS students nominated for the Star Student Award included Dalia Anguiano and LeAnna Kehl. 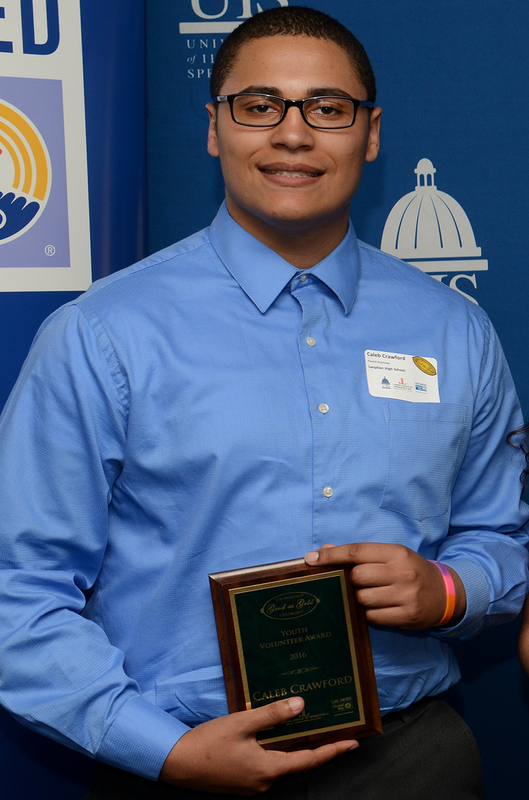 Lanphier High School student Caleb Crawford of Springfield was honored with the Youth Volunteer Award. He has made an impact on the Springfield community through his volunteer work and serves as a role model for other students. Crawford has volunteered at Lanphier, the Boys and Girls Club, St John's Breadline, Salvation Army, Abundant Faith and Western Oaks churches and is a basketball coach and referee at Iles School. He has been an avid volunteer throughout his high school career, not as a way to meet specific service learning hours, but rather to make his community a better place. He plans to pursue a career in law enforcement. Thirty-eight local volunteers were also honored with the Heart of Gold Award. Recipients included: Jacqueline Atchison, Roger Austin, Brent Baird, Melissa Blood, Michael Bowers, Mervin Brennan, Patrick Casassa, Alicia Clarke, Jay Cole, Cecil Crawford, Stacy Domescik, Tom Elliot, Sue Endsley, Marion Flemming, Patty Hale, Kelly Hamilton, Kent Hill, Sue Landgrebe, Robert Wayne LeMay, Candy Luthin, Cheryl Meyer, Traci Moore, Joseph Murphy, Stan Paulis, Mike & Jean Pennell, Drew Peterson, Cheri Plummer, Norma Ralston, Debbie Reed, Jessica Robinson, Angelica Salazar, Merle Shiffman, Caitlin Simhauser, Jill Steiner, Steven Thorpe and Mark & Sari Wancket. The winner of the 2016 Organization Agent of Service Award is The Matthew Project, which provides tutoring and mentoring services for homeless children and youth in partnership with Springfield Public Schools. The project fosters the academic, social and emotional development of children experiencing homelessness. “The positive impact that Matthew's volunteers have had on families is remarkable. Their work with participants instills pride and self-worth, which in turn creates successful students and outstanding citizens,” said Darla Haley, Springfield Public School’s homeless liaison. A total of 22 Sangamon County businesses were named to the Business Honor Roll sponsored by the UIS College of Business and Management and supported by The Greater Springfield Chamber of Commerce. The honor roll recognizes businesses that have made giving back to our community a priority. Businesses making this year’s honor roll include Ameren Illinois; Bank of Springfield; Brandt Consolidated; BUNN; Terry Farmer Photography; H.D. 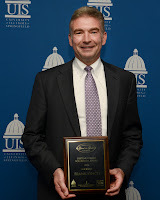 Smith; Heartland Credit Union; Illinois Association of Realtors; Kerber, Eck & Braeckel; Steve Koch, CFP, Ameriprise Financial; Mayfield Insurance and Financial Services; Memorial Health System; Noodles & Company; Orthopedic Center of Illinois; President Abraham Lincoln Hotel, a Double Tree by Hilton; RMS US LLP; R.W. Troxell & Company; SCHEELS; Small Business Growth Corporation; Springfield Electric; US Bank and Wells Fargo Home Mortgage. For more information on the awards, email volunteer@uis.edu or call 217/ 206-7716.